Cozy, updated vintage chalet on a quiet road with the East Branch Saco River across the street, a hiking trail in the back yard, less than 10 minutes from North Conway and just 5 minutes from Storyland! Main level: Living room with pullout sofa, wood burning fire place, access to the deck, full kitchen and large dining table. *Nearby Attractions for all seasons: Storyland (2.8 miles), North Conway Scenic Railway, Santa’s Village (43.5 miles), Tax Free Outlet Shopping, horseback riding, hiking, rock climbing, biking, river fishing, swimming, golf, canoeing/kayaking, scenic drives, Mount Washington Auto Rd, moose tours, ziplines, gondola rides, sightseeing, the scenic Kancamagus Highway, downhill skiing at one of the many nearby mountains, cross country skiing, snowmobiling, snowshoeing, tubing, ice skating and sleigh rides. My fiance, three-year-old son and I had a blast enjoying the skiing out the back door. It was a cozy little place to call home for a week while we explored the white mountains. Thanks very much for staying with us, and thanks for the great review! We are glad that you enjoyed the chalet, and the area. And yes, the Maple Glades next door, which are maintained by the Granite Backcountry Alliance, are AWESOME! Nicely furnished. Cozy ambiance. Loved the natural light. Great location. Stayed warm during a big snow and wind storm. Backcountry ski trail. Can walk to a nice restaurant. Thanks for your great review! We are so happy to hear that you had a nice time and enjoyed the chalet. We hope to see you again in the future. The deck at this house is lovely in summer. We had a great time, very convenient location, close to everything, great shopping, skiing nearby. The weather was just beautiful, very quiet area with a lot of hiking trails right next to the house. 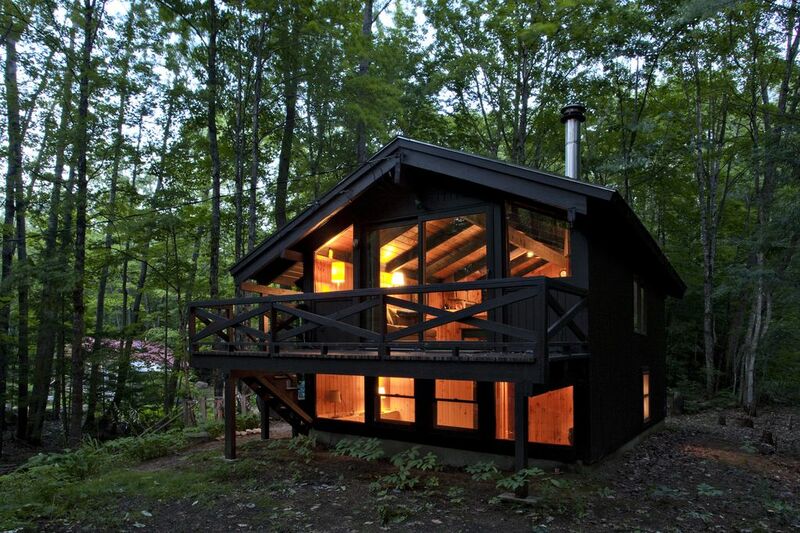 There was everything that we needed in the house, we enjoyed the evenings next to your beautiful wood stove. Thanks a lot for hosting us, we will definitely try to visit again in the future. It's great to hear you enjoyed the home and location of the property! It's nice having the hiking trails close by and the woodstove really is nice! Have a great winter and please visit again! The house is located on a quiet street off a main street. The place was perfect for two people traveling with two dogs. It is nestled right next to walking trails and very close to restaurants and shops for easy access to necessities while being quite private. It's great to hear the house was such an enjoyable place for your stay! Have a wonderful winter and please visit again someday! Our family of three enjoyed our stay at this chalet -- comfortable beds, easy access, wonderful decks, well equipped kitchen. The only downside for our summer stay was the lack of window screens. We had to keep the windows shut to keep the bugs out. Missed the fresh air though, especially at night. Thank you for your review, and we're glad that you enjoyed your stay! If you ever stay at one of our homes in the future, please let us know if you run into any issues while you are staying with us, and we will correct any issues that we can as soon as possible! The chalet is in a great location, and has more than enough room for two adults. I was pleasantly surprised by the modern amenities in the kitchen and bath, and I loved having access to a grill on the porch. The rooms could have been cleaner - there was pet hair on the couch and dead bugs in the dishes. Overall I was satisfied with the chalet. Be aware, the beds are the least comfortable I have ever slept on, and I opted for the couch after the first night. Thank you for the feedback on the amenities and grill! We are sorry to hear about the issues you encountered; if you stay with us in the future, please let us know about any issues you encounter during your stay and we will work to correct them!